I would like to address a few issues in response to Dr. Richard Keller’s letter published in the Salt Lake Tribune December 18, 2010. Dr. Keller’s article opined that health care is a ‘right’, reasoning that health care is as basic a human need as is food and shelter. I would argue that many people around the world manage to live every day without health care as we know it. However, they would be hard put to stay alive without food or, depending on the circumstances, perhaps even shelter. If healthcare were a basic human need, this would not be the case. Even if one were to agree with the opinion that health care is a basic human need, the question remains as to whether or not the federal government has the ‘authority’ to demand the purchase of a basic human need? Fundamentally, we all need food or we will die. However, we have not granted our federal government the authority to purchase food or be taxed. This is a simplistic argument but has the same underlying principle. Some have argued that because we all have a body and we will all get sick at some time, we are therefore a burden to society if we do not purchase healthcare so we will eventually end up costing society as a whole anyway. But the same implications can be drawn from arguments involving a true basic need: food. If you don’t get food you will get sick and ended up costing society. Shouldn’t we first mandate the purchase of food before we mandate the purchase of healthcare? Dr. Keller disagrees with the idea that mandating health care will infringe on our personal liberties. But in the purest sense, ANY infringement of our liberties by the government when they have not been granted the authority to do so by the people is one too many. The constitution was a document crafted after much study of other countries’ governments, most of which had failed. The observation was made that when the government oversteps is specified and enumerated authority, the decline in the government and society begins with the peril to the individual and his rights. Thus, great care was laid out to craft the constitution, only allowing the federal government specified powers. All other powers were to remain closest to the people through states’ rights. A federal mandate oversteps the enumerated powers. The states may have the right to enact such a mandate, but as spelled out by our constitution, the federal government does not. Many argue that health care is different than regular commerce. The irony is that the clause through which the federal government is trying to usurp more authority IS THE COMMERCE CLAUSE. 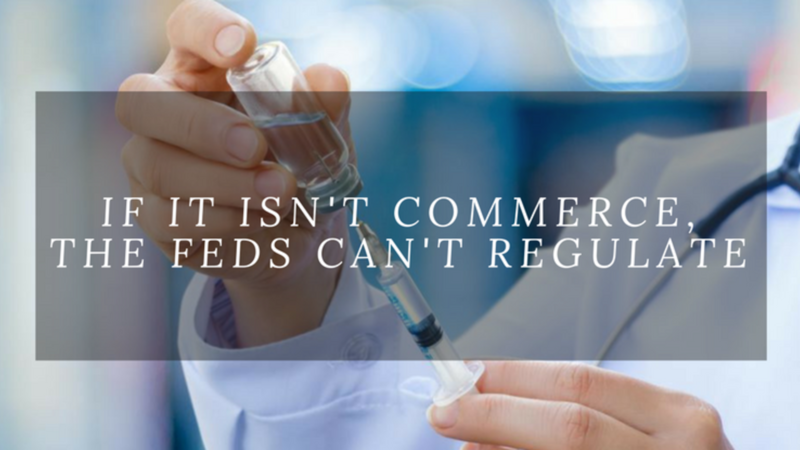 You can’t have it both ways: it must either be defined as commerce so the federal government can assert the right to regulate it, or you lose the argument for the mandate all together. Dr. Keller quotes the American Board of Internal Medicine which defines professionalism as, “constituting those attitudes and behaviors that serve to maintain patient interest above physician self-interest.” The underlying assumption is that this belief is applied and accepted by all physicians and to do otherwise is unethical. In the simplest form of the argument, health care would then cease to exist. If we put only patient interest first, one may or may not get paid and therefore when your clinic closes (to the peril of the hundreds or thousands of patients you see), that is ok because you were putting patient interest first to maintain professionalism and be ethical. I disagree. I believe I can be a professional and ethical physician and see to my patients’ interests without maintaining the patients’ interests above my own. This allows me to be a balanced, happy, functional individual who serves the greater good by operating a functioning clinic that serves many in my community. The fallacy I believe Dr. Keller misses is the principle that people make choices every day in regards to their health and the care they receive, whether they have insurance or not. They do look at health and health care as a commodity to be traded. Although one cannot avoid sickness, we do make choices as to healthy living, smoking, preventative care, etc. every day. You make those choices knowing there are tradeoffs down the road. The difference is whether you think you can beat the system or defer payment on that commodity, your health. Sometimes you win, sometimes you lose. There are unfortunate situations that do arise and cost does become prohibitive. However, there is also an issue of personal responsibility. Everyone will eventually die. How much and what quality of life one has is at the most basic a patient choice, but they must also choose at what cost—cost to them and cost to society. For those unfortunate circumstances that do occur, we should be working on finding ways to help, but an individual mandate, I believe is not the answer. Judge Hudson simply upheld the principle of liberty which is a higher order principle than healthcare.